"In the final delivery of the trilogy, the players have to destroy the One Ring throwing it into the Mount Doom, freeing the Middle-earth from the clutches of Sauron." The Lord of the Rings: The Return of the King is made right in the style of the last movie and it includes the adventure and action elements in interactive and detailed game levels. A totally new way of multiplayer cooperation will let the players form their own Fellowship before taking the great voyage to the Middle-Earth. 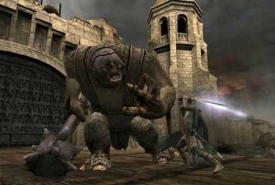 Defend, like Gandalf, the walls of the Minas Tirith, reunite the Paths of the Dead like Aragorn, Legolas or Gimli, and with Frodo and Sam, bring the Ring to the depth of the Mountain Doom in the official game The Lord of the Rings: The Return of the King.